Looking for types of mushrooms? Whether your interest in mushrooms lies in commercially grown varieties, wild mushrooms, or perhaps both, mushrooms are among the most fascinating of plant life. Edible mushrooms are packed with antioxidants and lend an earthy flavor to almost any cooked dish. Many mushrooms, though, lack flavor or are poisonous. Some can kill you. If you’re interested in collecting wild mushrooms, take note: the art of mushroom picking is just that – an art. There are no scientific tests to determine if a mushroom is poisonous. Over the years, we’ve gained anecdotal knowledge about the safety of mushroom types simply by making observations. Safe mushrooms are those which have been eaten by many people with no ill effects; we learn that a mushroom is poisonous because someone has become ill from eating it. An old saying sums it up: “There are old mushroom hunters and bold mushroom hunters; but there are no old, bold mushroom hunters.” Better to be old than bold, we say. Take an experienced mushroom hunter and a good guidebook with you when mushroom hunting. Some poisonous types mimic edible kinds so careful inspection is absolutely critical. Button mushroom. Button or white mushrooms are the most commonly available mushrooms in the grocery store. In the wild, though, their look-alikes are very poisonous. Chanterelle (Cantharellus) is considered a gourmet mushroom. It is bright orange or yellow, with a tender texture and intense flavor. Chanterelle grows under hardwood trees, such as oaks, and is harvested in the fall. Look-alikes are poisonous. Cordyceps (Cordyceps militaris) is an edible mushroom known primarily for its medicinal benefits, and has been studied for both anti-cancer and anti-inflammatory effects. Cremini. Sold commercially, these brown mushrooms look like button mushrooms, but they have a deeper flavor. Fly Amanita looks a bit like a yellowish or orange golf ball. This rounded mushroom is covered with white, bumpy warts. It is found in woodland areas and is poisonous. Destroying Angel (Amanita sp.). This highly poisonous mushroom grows in woodlands from summer to fall. It is almost identical to the edible button mushrooms you buy in the grocery store. As the name implies, it is deadly. Giant Puffball (Calvatia). Aptly named, this huge, white mushroom grows from 8 to 24 inches in diameter. It is an edible mushroom that grows in parks, meadows and woodlands. Green-spored Lepiota. (Chlorophyllum). Found in grassy areas, this white, upright mushroom can grow 8 inches across. It leaves spores that are gray-green in color. Steer clear of this poisonous species. Horn of Plenty (Craterellus cornucopiodes). This horn-shaped mushroom matures from spring to fall, depending on your climate. Edible. Jack-O-Lantern mushroom (Omphalotus, Clitocybe). These woodland mushrooms resemble sulfur mushrooms, but they’re poisonous. They grow at the base of trees or on decaying roots. Lactarius or milk mushroom. These brownish-red, flat-topped mushrooms grow in wooded areas. Some are edible; others are not. Meadow mushroom (Agaricus). This small, humble mushroom is found in meadows and woodlands from late summer to fall. It has gills that mature from pink to dark brown. Morel (Morchella). This delicious, edible mushroom grows in woodland areas in early to late spring. It has a sponge-like appearance. False morels resemble morels, but are poisonous. Oyster These mushrooms have a multi-layered appearance and a mild, flavorful taste. They’re available commercially and easy to grow at home. Portabello. This large, beefy mushrooms can grow up to 6 inches across. They taste delicious grilled and are often used as a meat substitute. Russula mushroom (Russula sp.) Russula mushrooms mature from late summer to fall and have a flattened appearance and brittle texture. Russula mushrooms are known for their vivid colors, which can range from red to purple to green to yellow. Some are poisonous, while others are safe to eat. Shaggy mane (Coprinus) matures in late summer, and is found in grassy areas. This mushroom has an upright form. The edges of the mushroom are fringed and become dark as the mushroom grows. Edible. 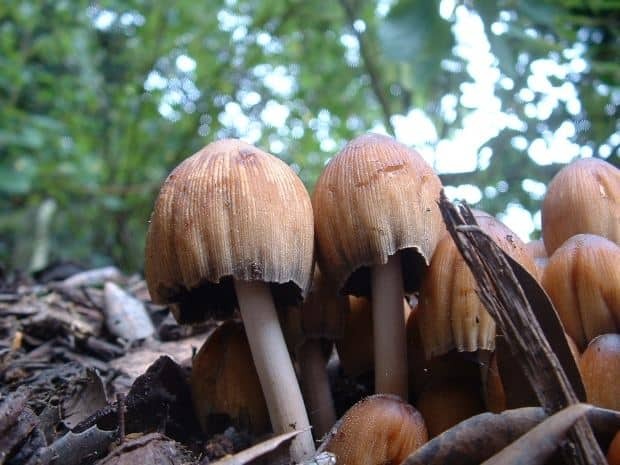 Shitake mushroom (Lentinula edodes) is an East Asian mushroom that is well known as both a standard edible mushroom, and one that is known for medicinal benefits. Slippery jack (Suillus, Boletus). These large, meaty mushrooms are light to dark brown. Found under pine needles, they are edible. Smooth white Lepiota. This edible mushroom has a tall, slender stem and is pure white. It grows in woodland areas from summer to fall. Sulfur or Chicken mushroom (Laetiporus). These yellow or orange mushrooms have a layered appearance and resemble oyster mushrooms. They mature from summer to fall, and are safe to eat if growing on wood. Information on Wild Mushrooms from Penn State University. It would be more informative if there were pictures of each mushroom from a to z. Especially the poisonous ones. I will continue to search. Grazi! Yes , agreeing 100% . If there is picture more useful. Thanks. I agree, that would really be helpful. I would like to know the types of mushroom from a to z with pictures and poisonous mushrom with picture also…in order to prevent those dangerous kind of mushrooms. Fly amanita or fly agaric or amanita muscaria, should not be in that list . The mushroom is not deadly but psychedelic. I carry the National Audubon Society field guide to mushrooms. Excellent photos and detailed info. Totally worthless without pictures. What a waste! I’m just trying to figure out what kind of mushrooms I’m eating that I got at my local foodbank! Shiitake (Lentinula edodes) is a native of edible mushroom East Asia which is cultivated, and is consumed in many Asian countries. It is considered a medicinal mushroom in some forms of conventional medicine.